ADAM GILCHRIST TO ANNOUNCE INDIA’S FIRST BRADMAN SCHOLARSHIP CRICKETER | The International Cricket Hall of Fame. 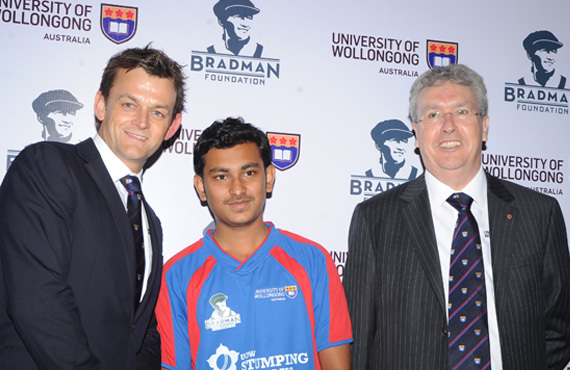 Champion Australian cricketer Adam Gilchrist AM will announce the inaugural recipient of the Bradman Scholarship for a talented Indian cricketer to study at the University of Wollongong (UOW) in Australia at a special media conference in Bangalore on 13 November. Gilchrist launched the annual scholarship program in India last year in his role as UOW’s Ambassador in India, and has now returned to introduce the inaugural recipient. The scholarship, named in honour of the world’s greatest-ever cricketer, Sir Donald Bradman, is for an Indian student to study in Australia at UOW. The University has combined with the Bradman Foundation, a charitable trust established in 1987 with the blessing of Sir Donald Bradman to promote cricket as a cultural and sporting force, to offer its first international scholarship for undergraduate study at one of Australia’s leading universities. The successful applicant is Mohammed Shuja Khan, from Hyderabad, who will start a Bachelor of Engineering (Civil) at UOW in February 2014. Mohammad is an outstanding scholar as well as an accomplished cricketer who works hard to promote participation in the game among children in his home city (see profile at the end of this release). Gilchrist said he was delighted to have such a worthy first recipient of the Bradman Scholarship, who displayed all the characteristics that the organisers were looking for when they established it in Sir Donald’s name. The scholarship was established to be awarded to an Indian student – male or female – who has completed secondary school and who demonstrates a combination of academic, sporting, personal and social skills, as well as strong participation in cricket. “Sir Donald Bradman left an enduring legacy to the game of cricket with his incredible achievements, and Indian cricket fans understand that as well as anyone,” Gilchrist said. “Sir Donald, through the establishment of the Foundation that bears his name, also had a vision that through education and the advancement of youth, cricket could be strengthened and advanced. “The University of Wollongong Bradman Foundation Scholarship was established to provide that opportunity for educational advancement of a young Indian person, and I am extremely proud to be involved. “We were looking for a well-rounded young person who will be able to fulfil Sir Donald’s vision as our first scholarship-holder, and we are sure we have found that person in Mohammed. Gilchrist is currently on an annual visit to India to talk to Indian corporations interested in establishing an Australian presence at UOW’s Innovation Campus. Gilchrist, the former wicket-keeper batsman, who captained Australia to a 2-1 Test series win over India in 2004, was inducted into the Sport Australia’s Hall of Fame in October 2012. UOW Vice-Chancellor Professor Paul Wellings CBE said the UOW Bradman Scholarship was an indication of the growing strength of the University’s ties with India, as well as with the Bradman Foundation. “This is an extremely important initiative from the University’s point of view,” Professor Wellings said. “It gives us a chance to help fulfil Sir Donald’s vision for the advancement of youth and cricket while also offering a great opportunity for an Indian student to come to Australia to study at our university and become involved in the Bradman Foundation. Bradman Foundation Executive Director Rina Hore said the Foundation was delighted to welcome Mohammed Khan as the first scholarship recipient. “The Bradman Foundation was established to promote cricket as a valuable cultural and social force in the community, and this scholarship fulfils that objective,” Ms Hore said. “Shuja will be coming to Wollongong to study and learn about the Australian way of life, and he will also have the opportunity to become involved in the Bradman Foundation and become a future ambassador for us. ABOUT THE UNIVERSITY OF WOLLONGONG: UOW is one of Australia’s leading universities, recognised in the top two percent of the world’s universities in the two main rankings (QS and The Times Higher Education). Its main campus and its Innovation Campus research and development precinct are located in the coastal city of Wollongong, one hour south of Sydney in the State of New South Wales. Visit www.uow.edu.au for more details. ABOUT THE BRADMAN FOUNDATION: The Bradman Foundation is based in Bowral, in New South Wales, Australia. It owns and operates the Bradman Museum and International Cricket Hall of Fame and manages Bradman Oval where the young Don Bradman first learned to play the game. The Bradman Foundation, a non-profit charitable trust, was established in 1987 with the full support of Sir Donald Bradman AC to promote cricket as a valuable cultural and sporting force within the community. Each year the Foundation honours leading cricketers by the naming of Bradman Honourees. Previous Bradman Honourees have included Indian batsman Rahul Dravid and Australian fast bowler Glenn McGrath. Visit www.bradman.com.au for more details. Mohammed Shuja Ahmed Khan is a meritorious student from Hyderabad in India with a real track record in cricket. Shuja is keen to pursue Bachelor of Engineering –Civil with the University of Wollongong (UOW) and has been awarded the Undergraduate Excellence Scholarship by UOW due to his outstanding academic performance. huja has been a member of Chandrayangutta Sports Development Association since 2006. He has served in many leadership roles for his cricket team and is recommended by the coach as a dedicated athlete who leads by examples and is an asset to any future cricket team. Shuja participated in Cricket coaching camps conducted by the Greater Hyderabad Municipal Corporation and due to his skills and dedication in cricket he was selected for the Inter‐zone championship Mayor Trophy and All Greater Hyderabad Municipal Corporation tournaments in 2011‐2013. Shuja also volunteered with his team at the local cricket clubs to encourage younger children to join sports and coached them in cricket. Shuja displays a blend of academic, sporting, personal and social skills which makes him a deserving winning candidate of the inaugural UOW Bradman Scholarship. Shuja will commence his studies at UOW in February 2014.